Home » Advice & Information » How to reach Bardia National Park? Daily buses run from Kathmandu to Dhangadhi or Mahendrenagar (alight at Ambassa). The bus takes around 15 hours and is a beautiful though long journey as you pass through mountains and forests and then through the mainly flat and rural Terai. Tickets cost from 1200 Nepalese Rupees (approx. US$17). Night buses also operate. There are also daily flights to Nepalgunj from Kathmandu for around 12,400 Nepali Rupees (approx. US$158) which make the journey much shorter and easier. Two buses leave daily to Mahendra Nagar and Dhangadhi passing via Ambassa. Journey time is about 12 hours. Ticket cost around 1,100 Nepali Rupees. Mny buses runs from Butwal to Dhangadhi / Mahendranagar (alight at Ambassa). Bus takes around 7hours. ticket cost 900 Nepali Rupees. City at Indian border is Banbasa. On Nepali side, city name is Mahandranagar. Crossing the border is quite easy. When you reach Banbasa, take a cycle or a horse rickshaw and ride up to the Indian border. There is a small office opens 24hours, but better to cross the border during the day to be sure that the border officers are awake! They will stamp your passport. 500 meter latter, you will find on your right side the Nepali office. Do not forget to take a visa or you will have trouble to leave the country! It costs 25USD for 15 days visa to pay in Cash. You can also pay in Indian rupees or Euro. And here you are! Ask help to local people to find a bus to Bardia. Many buses run from Mahendrenagar to Kathmandu (alight at Ambassa), the bus takes around 4-5 hours, costing around 400 Nepali rupees. Bardia National Park is about 90 kilometres from Nepalganj. From Nepalganj, one can reach Bardia National Park in 3 hours journey by bus easily available from Nepalganj to Ambasa, Ambasa from where you can go by vehicle of your hotel or resort or by public bus. HOW TO REACH BORDER FROM DELHI? You can reach Banbasa by taking a local night bus from Anand Vihar (Delhi) going to Banbasa. It would take 9 hrs to reach Banbasa. 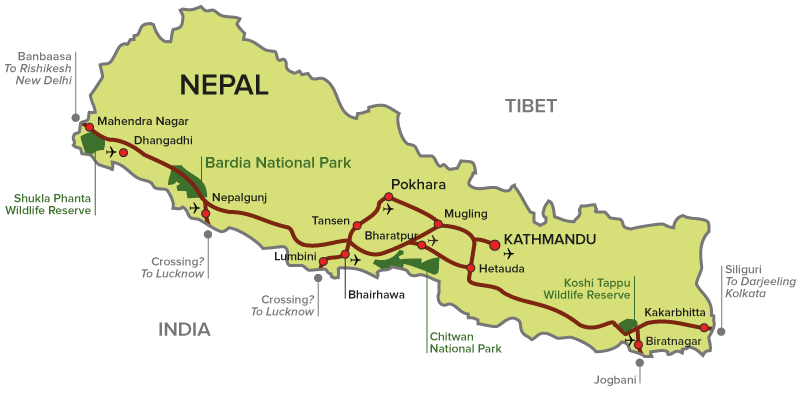 It is the shortest way to reach Nepal, but bus can be tough. Other option is to take a train up to Bareilly or Rudrapur. And from there, take a bus. It takes around 6hours to reach Rudrapur and then 3hours to reach Banbasa by bus. HOW TO REACH BORDER FROM LUCKNOW? You will have to come to India-Nepal International border town Rupaidiha. Rupaidiha is a small border town in India which lies in Baharaich district and is just 185 kilometres from Lucknow via Baharaich town. From Rupaidiha, Nepalganj is just 5 kilometres which you can cover by rickshaw, city bus, three-wheeler tempos etc. Frequent Air-conditioned and normal buses, shared taxis, reserved taxis are available for Nepalganj round the clock. There are two bus stands in Lucknow, one is at Alambagh and another is at Kaisarbagh. Taxi stand for Nepalganj is located near Artificial Limb Centre, Daliganj, Bans Mandi in Lucknow. HOW TO REACH BORDER FROM VARANASI? You will have to cross the border at Nepalganj also. To reach the border, better to take a train upto Gorakhpur and from there take a bus to the border.